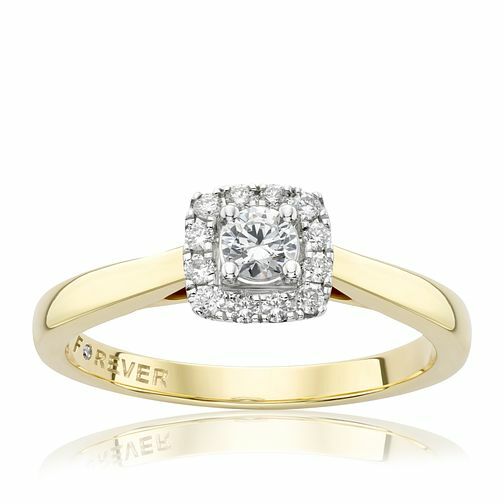 The Forever Diamond presents this breathtakingly beautiful diamond ring. Crafted from luxurious 18ct yellow gold, this stunning diamond solitaire ring is accentuated with a square halo of smaller sparkling diamonds totalling a quarter of a carat of diamond. Each Forever Diamond has been independently certified by the GSI for colour, clarity, carat and cut. 18ct Gold 1/4 Carat Forever Diamond Ring is rated 3.0 out of 5 by 2. Rated 1 out of 5 by Anonymous from Great product, poor decision by Hitachi Credit Wanted to purchase this ring to propose to my girlfriend who is by far the best thing to ever happen to me in my 50 years. I do have blemishes on my credit file but I'm in full time employment and the ring was easily affordable - I'm able to have credit cards with credit limits in four figures which says something, but Hitachi Credit (used by H Samuel to provide a credit facility) refused me meaning I'm having to delay getting engaged - the ring is less than a £1,000 and there was an offer I think giving a 20% discount at the time which I've now missed too. I'm writing this 'review' because H Samuel have emailed me today thanking me for my purchase and asking me to review it. Rated 5 out of 5 by Anonymous from Brilliant quality Excellent size i purchased this ring to propose to my current Girlfriend later on this year, its still a surprise she doesnt know yet- but it looks absolutely magnificent like previous reviews have said the pictures on the website do not do it justice, it arrives in a fairly large box with a bow wrapped around saying forever diamonds, inside theres a small space for the ring box with containing the ring and another section where a laminated card sits which certifies the authenticity of the diamond and when it was examined etc etc, but onto the ring itself the detail of the ring is astonishing and definitely worth the price. hopefully my partner will fall in love with it as i did when i saw it!